MINERA SABATER supplies the ceramics industry with clay blends for the manufacture of floor and wall tiles, extruded stoneware, sanitaryware and faced bricks. The company's principal line of activity is the production of ceramic clays for white bodies. However, clay blends which have undergone the same rigorous selection and control procedures are also prepared for use in red bodies. The clays' low organic content makes them suitable for fast single firing, and gives the tiles great stability. 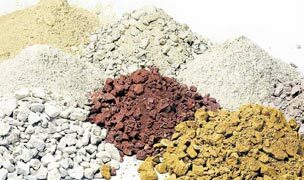 The presence of a fully equipped laboratory at the pit helps to ensure that all clay blends supplied are thoroughly examined, and that the product is tailored to the needs of each customer.